The nine symphonies of Ralph Vaughan Williams (1872-1958) were composed over more than half a century. He began sketching ideas for A Sea Symphony in 1903, two years after the death of Queen Victoria, and completed the ninth in 1958, two years before John F Kennedy was elected 35th President of the United States. During this long period Vaughan Williams became one of the very few twentieth-century composers whose music was known to the general public. The range of his achievement was vast: from hymn tunes to operas and symphonies, music for every day and for special occasions, for coronations and flower festivals, for films and classrooms—here was a composer concerned with writing music not only for the concert hall but also for anyone, amateur or professional, who was musical—a characteristic he displayed from his earliest years. Versatility in a composer does not, of itself, guarantee greatness; nor, for that matter, does doing things that have not been done before. Vaughan Williams was both versatile and original, but he was much more than that. We know that at around the time he began sketching the first of his nine symphonies—A Sea Symphony—he came into contact with English folk song, and the effect on his own music was indeed profound. This was not quite the equivalent of a Damascene conversion, for in several of his original songs, written prior to his involvement in the English folk song revival, his musical idiom is couched in similar terms: in 1901, Linden Lea, in 1902 Blackmwore by the Stour, in 1903 itself, Tears, Idle Tears, Silent Noon and The Winter’s Willow. These songs are clearly the work of a distinctive English composer with a deep feeling for words. Yet coincidentally coming into contact with ethnic English folk song may well have been akin to finding that which, instinctively, he felt was there all along. Such a view is reinforced by the recent unearthing, and public premiere in 2011, of A Cambridge Mass, which Vaughan Williams submitted for his Cambridge doctorate in 1899. The work is one in which he first flexed his muscles in terms of large-scale music for soloists, chorus and orchestra, such choral-orchestral works being greatly significant in England in the years surrounding the dawn of the twentieth century. In many ways, if A Cambridge Mass suggests Vaughan Williams’s emerging individuality, the work’s purely orchestral central movement implies a quasi-symphonic approach, a genre already tackled by other emerging masters of symphonic form combining voices and orchestra—most notably Mahler, Sibelius and Elgar. Elgar’s The Black Knight had appeared almost a decade earlier, a work which he termed ‘a symphony for chorus and orchestra’ (Elgar’s publishers described it as a cantata). Elgar’s original title indicates the scale and intent of his work, but by the time of Vaughan Williams’s A Cambridge Mass, the older composer’s The Dream of Gerontius was to make a more lasting impression on the younger man. In the Elgar memorial issue of Music and Letters in January 1935, Vaughan Williams contributed an article entitled ‘What have we learnt from Elgar?’—during the course of which he wrote: ‘I find that the Elgar phrase which influenced me most was ‘Thou art calling me’ in Gerontius, not so much perhaps in its original form as when it comes later on in combination with another theme. For proof of this, see A Sea Symphony [quoting the passage].’ Later, in the same article, Vaughan Williams cited a passage in A London Symphony (his second symphony) also influenced by the same phrase. Quite clearly, through his own admission, in Gerontius Elgar had exerted a lasting influence on Vaughan Williams, even if that work’s religious message meant little or nothing to the younger man. For it was, in no small way, the haunting beauty of the words of the Liturgy—not so much their foundation on Christian beliefs, for Vaughan Williams remained a lifelong agnostic—and the timelessness of those portions of the Latin text he chose to set, which ignited his creative imagination. He was to return to the text of the Catholic Latin Mass over twenty years later in his G minor setting for a cappella choir. As we shall see, Vaughan Williams was by no means constrained by having composed one setting of a text—occasionally, throughout his long creative life, he would return to texts for a second time, the differences often providing illuminating insights into his varied musical language. But by the early 1890s, Vaughan Williams’s emerging humanism (in the sense of ‘a man who denies the existence of God’) was to lead him to the writings of the American poet Walt Whitman (1819-1892). Whitman’s poetical collection Leaves of Grass, which appeared in various editions throughout his life, made a deep impression on Vaughan Williams and on other young composers who were moved to set Whitman’s texts. Whitman’s sentiments echoed the revelations of Vaughan Williams’s great-uncle Charles Darwin, who had known and encouraged the musical ‘curious boy’—now a composer about to embark on what would become his life’s work. Whitman’s poetry may have been the initial spur, and as Ursula Vaughan Williams wrote in her biography of her husband: ‘Leaves of Grass, in several editions … was his constant companion. It was full of fresh thoughts, and the idea of a big choral work about the sea—the sea itself and the sea of time, infinity, and mankind, was beginning to take shape in many small notebooks … He kept it very much to himself, sketching and re-sketching the text, using, discarding, and re-arranging the poems.’ By 1903, Vaughan Williams’s artistic journey, though not necessarily the route it would take, was settled. And if Whitman’s poetry was ‘his constant companion’, the idea of a subsidiary work to the ‘big choral work about the sea’, also set to Whitman, was a relatively short step on that journey. If one can readily discern aspects of the composer’s character in Toward the Unknown Region—the freedom to challenge, and to experience elation at what is thereby discovered—the work’s success and Stanford’s support must have further spurred Vaughan Williams to finish the much larger Whitman work on which he had been engaged for some years, additionally encouraged by studying orchestration with Ravel in Paris in 1907-8: Ravel was three years his junior. As A Sea Symphony neared completion, other—quite different—works came from his pen: a string quartet, incidental music for Aristophanes’ play The Wasps and a song cycle for tenor, string quartet and piano—On Wenlock Edge—all demonstrated the growing range of his art. The first performance of A Sea Symphony (‘Dedicated to R L W’—Sir Ralph Wedgwood, a cousin of the composer on his mother’s side) took place on the composer’s thirty-eighth birthday, 12 October 1910, at that year’s Leeds Festival, with Vaughan Williams himself again conducting; the soprano and baritone soloists were Cecily Gleeson-White and J Campbell McInnes. The first sketches for this work (namely, parts of the scherzo and slow movement) were made in 1903, and it was gradually worked out during the next seven years. It was first produced at the Leeds Festival in 1910, and has since been performed (in a slightly revised form) at Oxford, Cambridge and Bristol. The plan of the work is symphonic rather than narrative or dramatic, and this may be held to justify the frequent repetition of important words and phrases which occur in the poem. The words as well as the music are thus treated symphonically. It is also noticeable that the orchestra has an equal share with the chorus and soloists in carrying out the musical ideas. The symphony is written for soprano and baritone soli, chorus and orchestra. The two soloists sing in the first and last movements. The slow movement contains a solo for baritone (and also a long refrain for orchestra alone) while the scherzo is for chorus and orchestra only. This vast score may be considered by some listeners as a huge cantata in four movements—but the work’s sweep, of Mahlerian proportions, particularly in its last movement, the cast of the four movements and the inter-connecting thematicism, point unarguably to a genuinely symphonic structure. The illustrative ‘word painting’ of Whitman’s text is magnificently reflected by the music, especially in the two middle movements (corresponding to the slow movement and scherzo of the symphonic model). Since the earliest performances, commentators have recognized ‘On the beach at night alone’ as the finest and most evocative part of the whole work, with its great reflective climax inspired by the words ‘A vast similitude interlocks all’. 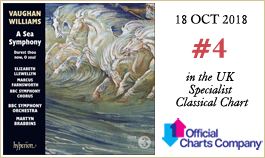 The programme of the premiere began with A Sea Symphony, following which Rachmaninov was the soloist in his second piano concerto before Richard Strauss’s Don Juan ended the concert. These works were conducted by Stanford, whose reaction to his pupil’s first symphony is not recorded. The day before, Rachmaninov had been in Leeds to conduct the second performance in Great Britain of his own second symphony. There are interesting parallels between A Sea Symphony and the first large-scale work Rachmaninov wrote after hearing it. This was his choral symphony, The Bells, completed in 1913: like A Sea Symphony, it was also first conducted by its composer. Both are settings of texts by American poets—Whitman in A Sea Symphony, Edgar Allan Poe in The Bells. Both are in four movements, for soloists, chorus and orchestra, and the overall shape of each work is similar, particularly in their scherzos: they are in 3/4 and come third in the order of movements, both being for chorus and orchestra without soloists. Hearing the first performance of A Sea Symphony may have planted in Rachmaninov’s mind the notion of composing a similar work, which came to fruition three years later—not the last time Rachmaninov was to be affected by Vaughan Williams’s music. 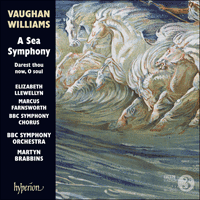 Fifteen years after the premiere of A Sea Symphony, Vaughan Williams was firmly established as the most significant English composer of his generation. He had, by 1925, composed the first three of his wholly individual nine symphonies, had volunteered for and served in the army during the Great War, and his music—like Elgar’s before him—was known to the widest possible audience, from King to butcher’s boy. The significance of the attraction for Vaughan Williams of fine literature, from whatever source, was powerfully demonstrated in 1925 by the completion of his oratorio Sancta Civitas, for tenor and baritone soloists, three choruses (main chorus, semi-chorus, and distant boys’ chorus) and orchestra, to an extended Biblical text. That year also saw the use of a wordless chorus in Flos Campi (for solo viola, mixed choir and orchestra)—each movement headed by (but not setting) a quotation from the Song of Solomon—as well as a Magnificat and Nunc dimittis. The widely used hymn book Songs of Praise also appeared that year, which he had jointly edited and to which he contributed a number of new hymn tunes, several of which subsequently entered the canon of familiar Sunday service hymn singing, as those in The English Hymnal had done twenty years before. Nor did those works constitute all of Vaughan Williams’s word-setting in 1925; no fewer than four sets of songs to secular poetry appeared that year, including Three Poems by Walt Whitman (Nocturne, A Clear Midnight, and Joy, Shipmate, Joy! )—the last of which, in its nautical references, has more than an allusion to parts of A Sea Symphony. The Whitman songs were not Vaughan Williams’s only settings of the poet at that time: he returned to Whispers of Heavenly Death—indeed, to the very text he had used in Toward the Unknown Region—for a new, single, setting of Darest thou now, O soul. The new setting (or was it possibly contemporaneous with the original, now revised?) naturally follows the same broad outlines of the text in terms of emphases in musical lines, but it is not a slavish reflection—rather is the music even more personal, as though, having begun the journey, the traveller pauses (as in Winterreise) to take stock and reaffirm his inspiration. This was, as may well be imagined, an unusual step for Vaughan Williams to have taken, and very little is known about this short work, a song for unison voices and piano or (as in this version) for voices and string orchestra. Perhaps it was originally intended to be the fourth of that year’s Whitman group—who knows?—but it was published as a short stand-alone setting for unison voices by Curwen, the version with string orchestra ‘arranged by W H’ as the manuscript has it. Unison choral settings were very much ‘in the air’ in the United Kingdom during the 1920s and ’30s—the community singing movement, largely promoted by The Daily Express, was proving popular between the wars. Vaughan Williams would have been well aware of this development, reinforced by editing the nation’s hymn tunes. He returned to the medium in 1940 in his Six Choral Songs, to be Sung in Time of War, and his unison songs culminated in 1943 in the fine song The New Commonwealth to words by Harold Child, the music drawn from that of his first film score from 1940, 49th Parallel. But Vaughan Williams’s greatest unison setting is the magnificent Festival Te Deum of 1937 for King George VI’s coronation with organ or orchestra, ‘founded upon traditional themes’ as the score says, a work which has tended to be overshadowed by Walton’s more splendiferous fully choral Coronation Te Deum of 1953. Curiously, we may note that Rachmaninov’s Opus 41, Three Russian Songs for unison voices and orchestra, was begun in 1926; he would surely have been unaware of Vaughan Williams’s unison song of the year before—yet as he was a regular visitor to Britain, can we be sure this is merely another coincidence? Ralph Vaughan Williams (1872-1958) composa ses neuf symphonies sur une période de plus d’un demi-siècle. Il commença à esquisser des idées pour A Sea Symphony en 1903, deux ans après la mort de la reine Victoria, et acheva la neuvième en 1958, deux ans avant l’élection de John F Kennedy comme trente-cinquième président des États-Unis. Au cours de cette longue période, Vaughan Williams devint l’un des très rares compositeurs du XXe siècle dont la musique était connue du grand public. Son œuvre est d’une très grande diversité: des airs d’hymnes aux opéras et aux symphonies, de la musique de la vie quotidienne ou destinée à des événements spécifiques, pour des couronnements et des fêtes florales, pour des films et des écoles—c’est un compositeur qui écrivait de la musique non seulement pour le concert mais aussi pour tous les musiciens, amateurs ou professionnels—caractéristique dont il fit preuve dès son plus jeune âge. Chez un compositeur, la polyvalence n’est pas, en elle-même, une garantie de grandeur; pas plus, d’ailleurs, que la faculté de faire des choses jamais faites auparavant. Vaughan Williams était à la fois polyvalent et original, mais il était beaucoup plus encore. On sait qu’à peu près à l’époque où il commença à esquisser la première de ses neuf symphonies—A Sea Symphony—il commença à s’intéresser au chant traditionnel anglais, ce qui eut un effet profond sur sa propre musique. Ce ne fut pas vraiment une sorte de conversion de Damas, car dans plusieurs de ses mélodies originales, écrites avant de s’impliquer dans le renouveau de la chanson traditionnelle, son langage musical est déjà formulé en des termes analogues: en 1901, Linden Lea, en 1902 Blackmwore by the Stour, en 1903 même, Tears, Idle Tears, Silent Noon et The Winter’s Willow. Ces mélodies sont typiquement l’œuvre d’un véritable compositeur anglais doté d’un sens profond du verbe. Pourtant, le fait d’être entré tout à fait par hasard dans l’univers du chant traditionnel anglais inspiré du folklore fut peut-être pour lui le révélateur d’un aspect de sa personnalité qu’il percevait, d’instinct, depuis toujours. Une telle opinion est renforcée par la récente découverte et la création publique en 2011 de A Cambridge Mass, que Vaughan Williams soumit pour son doctorat à Cambridge en 1899. Dans cette œuvre, il chercha pour la première fois à se faire la main dans le domaine de la musique de grande envergure pour solistes, chœur et orchestre, ce genre d’œuvres chorales et orchestrales qui avaient pris une grande importance en Angleterre au tournant du XXe siècle. À bien des égards, si A Cambridge Mass semble révéler l’émergence de l’individualité de Vaughan Williams, le mouvement central purement orchestral de cette œuvre implique une approche quasi symphonique, genre déjà abordé par d’autres maître émergents de la forme symphonique alliant voix et orchestre—notamment Mahler, Sibelius et Elgar. The Black Knight d’Elgar est antérieure de presque dix ans; il qualifia cette œuvre de «symphonie pour chœur et orchestre» (les éditeurs d’Elgar la présentèrent comme une cantate). Le titre original d’Elgar révèle l’ampleur et le dessein de son œuvre, mais à l’époque de A Cambridge Mass de Vaughan Williams, The Dream of Gerontius de son aîné allait faire une impression plus durable sur le jeune homme. Dans le numéro commémoratif de Music and Letters de janvier 1935 consacré à Elgar, Vaughan Williams écrivit un article intitulé «Qu’avons-nous appris d’Elgar?», dans lequel il indiqua: «Je trouve que la phrase d’Elgar qui m’a le plus impressionné est ‘Thou art calling me’ dans Gerontius, pas tant peut-être sous sa forme originale que lorsqu’elle revient plus tard associée à un autre thème. Pour preuve, voir A Sea Symphony [citant le passage]». Plus loin, dans le même article, Vaughan Williams cita un passage de A London Symphony (sa deuxième symphonie) également influencé par la même phrase. De son propre aveu, il est tout à fait clair que, dans Gerontius, Elgar exerça une influence durable sur Vaughan Williams, même si le message religieux de cette œuvre ne signifiait pas grand-chose, voire rien, pour le jeune homme. C’est surtout la beauté envoûtante des paroles de la liturgie—pas tellement ce sur quoi elles reposent dans la foi chrétienne, car Vaughan Williams resta agnostique toute sa vie durant—et l’intemporalité de ces fragments du texte latin qu’il décida de mettre en musique qui enflammèrent son imagination créatrice. Il allait revenir au texte de la messe catholique latine plus de vingt ans après avec sa messe en sol mineur a capella. Comme on le verra, le fait d’avoir déjà mis un texte en musique ne posait aucun problème à Vaughan Williams—à l’occasion, durant toute sa longue carrière de créateur, il revint à des textes une seconde fois, avec des différences qui apportaient souvent des aperçus significatifs sur la diversité de son langage musical. Mais au début des années 1890, l’humanisme naissant de Vaughan Williams (dans le sens d’un «homme qui nie l’existence de Dieu») allait le conduire aux écrits du poète américain Walt Whitman (1819-1892). Le recueil poétique de Whitman, Leaves of Grass («Feuilles d’herbe») qui parut dans diverses éditions tout au long de sa vie, impressionna profondément Vaughan Williams et d’autres jeunes compositeurs qui en vinrent à mettre en musique les textes de Whitman. Les sentiments de Whitman se firent l’écho des révélations du grand-oncle de Vaughan Williams, Charles Darwin, qui connaissait et encouragea le «garçon curieux» et musicien—maintenant sur le point de se lancer dans ce qui allait devenir l’œuvre de sa vie. La poésie de Whitman fut peut-être l’aiguillon initial et, comme l’écrivit Ursula Vaughan Williams dans sa biographie de son mari: «Leaves of Grass, dans plusieurs éditions … était son éternel livre de chevet qui regorgeait d’idées nouvelles; et l’idée d’une grande œuvre chorale sur la mer—la mer elle-même et la mer du temps, de l’infini et de l’humanité, commença à prendre forme dans beaucoup de petits carnets … Il la garda par-devers lui, esquissant et ré-esquissant le texte, utilisant, abandonnant et réarrangeant les poèmes.» En 1903, le cheminement artistique de Vaughan Williams, mais pas nécessairement la voie qu’il allait suivre, était fixé. Et si la poésie de Whitman restait «son livre de chevet», l’idée d’une œuvre complémentaire à la «grande œuvre chorale sur la mer», également sur un texte de Whitman, fut une étape relativement courte de ce cheminement. Si l’on peut facilement discerner certains traits du caractère du compositeur dans Toward the Unknown Region—allusion faite à sa liberté de provoquer et d’expérimenter l’ivresse qui en découle—le succès de cette pièce et le soutien de Stanford durent inciter encore davantage Vaughan Williams à terminer l’autre œuvre, beaucoup plus longue, sur des textes de Whitman qu’il avait entreprise quelques années auparavant. En outre, il avait travaillé l’orchestration avec Ravel, à Paris, en 1907–08, ce qui constituait aussi un encouragement: Ravel avait trois ans de moins que lui. Comme A Sea Symphony était presque terminée, d’autres œuvres—très différentes—sortirent de sa plume: un quatuor à cordes, une musique de scène pour la comédie d’Aristophane Les Guêpes et un cycle de mélodies pour ténor, quatuor à cordes et piano—On Wenlock Edge—, autant de reflets de l’élargissement de son champ d’action artistique. La première exécution de A Sea Symphony («Dédiée à R L W»—Sir Ralph Wedgwood, un cousin de compositeur du côté maternel) eut lieu le 12 octobre 1910, le jour où le compositeur fêtait son trente-huitième anniversaire, au Festival de Leeds, encore une fois sous la direction de Vaughan Williams lui-même; les solistes étaient la soprano Cecily Gleeson-White et le baryton J Campbell McInnes. Les premières esquisses de cette œuvre (à savoir certaines parties du scherzo et du mouvement lent) furent écrites en 1903, et elle fut peu à peu conçue au cours des sept années suivantes. Elle fut tout d’abord donnée au Festival de Leeds en 1910 et a depuis lors été jouée (sous une forme légèrement révisée) à Oxford, Cambridge et Bristol. Le plan de l’œuvre est davantage symphonique que narratif ou dramatique et l’on pourrait considérer que cela justifie la fréquente répétition de mots et de phrases importants qui se présentent dans le poème. Les mots, comme la musique sont ainsi traités de manière symphonique. Il est également visible que l’orchestre a un rôle analogue à celui du chœur et des solistes dans la réalisation des idées musicales. Cette symphonie est écrite pour soprano et baryton solistes, chœur et orchestre. Les deux solistes chantent dans le premier et le dernier mouvement. Le mouvement lent contient un solo de baryton (et aussi un long refrain pour l’orchestre seul) alors que le scherzo ne fait appel qu’au chœur et à l’orchestre. Les paroles sont tirées de divers poèmes de Walt Whitman que l’on trouve dans Leaves of Grass, à savoir «Sea-Drift», «Song of the Exposition» et «Passage to India». Il y a deux thèmes musicaux principaux qui se retrouvent dans les quatre mouvements: (1) la progression harmonique sur laquelle sont chantées les premières paroles confiées au chœur: «Behold, the sea itself»; (2) Une phrase mélodique [de la phrase de Gerontius citée par Vaughan Williams] entendue tout d’abord sur les paroles «And on its limitless, heaving breast, the ships». Certains auditeurs considéreront peut-être cette vaste partition comme une immense cantate en quatre mouvements—mais l’ampleur de cette œuvre aux proportions mahleriennes, en particulier dans son dernier mouvement, le moule en quatre mouvements et la thématique qui les relie, correspondent sans conteste à une structure vraiment symphonique. La musique reflète à merveille la «peinture des mots» qui sert à illustrer le texte de Whitman, surtout dans les deux mouvements centraux (correspondant au mouvement lent et au scherzo du modèle symphonique). Depuis les premières exécutions, les commentateurs reconnaissent «On the beach at night alone» comme la partie la plus belle et la plus évocatrice de toute cette œuvre, avec son grand et profond point culminant inspiré par les mots «A vast similitude interlocks all». Le programme de la première exécution commençait par A Sea Symphony, suivie de Rachmaninov en soliste dans son concerto pour piano nº 2 avant Don Juan de Richard Strauss pour terminer le concert. Ces œuvres furent dirigées par Stanford, dont la réaction à la première symphonie de son élève n’est pas rapportée. La veille, Rachmaninov était à Leeds pour diriger la deuxième exécution en Grande-Bretagne de sa propre symphonie nº 2. Il y a des parallèles intéressant entre A Sea Symphony et la première œuvre de grande envergure que Rachmaninov écrivit après l’avoir entendue. Il s’agit d’une symphonie chorale, Les Cloches, achevée en 1913: comme A Sea Symphony, elle fut également dirigée pour la première fois par son compositeur. Toutes deux mettent en musique des textes de poètes américains—Whitman dans A Sea Symphony, Edgar Allan Poe dans Les Cloches. Toutes deux sont conçues en quatre mouvements, pour solistes, chœur et orchestre, et la forme générale de chaque œuvre est similaire, en particulier dans leurs scherzos, à 3/4 et situés en troisième position dans l’ordre des mouvements, les deux scherzos étant écrits pour chœur et orchestre sans solistes. L’écoute de la première exécution de A Sea Symphony fit peut-être germer dans l’esprit de Rachmaninov l’idée de composer une œuvre analogue, qui se concrétisa trois ans plus tard—et ce ne fut pas la dernière fois que Rachmaninov fut affecté par la musique de Vaughan Williams. Quinze ans après la création de A Sea Symphony, Vaughan Williams s’était solidement imposé comme le compositeur anglais le plus important de sa génération. En 1925, il avait déjà composé les trois premières de ses neuf symphonies très personnelles, il s’était engagé comme volontaire et avait servi dans l’armée pendant la Grande Guerre, et—comme pour Elgar avant lui—un auditoire extrêmement large, du roi au fils du boucher, connaissait sa musique. L’importance du penchant de Vaughan Williams pour la bonne littérature, quelle qu’en soit la source, se confirma nettement en 1925 avec l’achèvement de son oratorio Sancta Civitas, pour ténor et baryton solistes, trois chœurs (chœur principal, demi-chœur et chœur éloigné de garçons) et orchestre, sur un long texte biblique. Cette année-là vit aussi l’utilisation d’un chœur sans paroles dans Flos Campi (pour alto solo, chœur mixte et orchestre)—chaque mouvement étant précédé d’une citation du Cantique des Cantiques (pas mise en musique)—ainsi qu’un Magnificat et un Nunc dimittis parallèlement au recueil de cantiques très utilisé, Songs of Praise, qu’il avait coédité et auquel il apporta sa contribution avec plusieurs nouveaux airs d’hymnes, dont certains furent intégrés plus tard au canon familier des chants d’hymnes de l’office du dimanche, comme ce fut le cas de ceux de The English Hymnal vingt ans plus tôt. Ces œuvres ne constituent pas la totalité des textes mis en musique par Vaughan Williams en 1925; au moins quatre recueils de mélodies sur de la poésie profane virent le jour cette année-là, notamment Three Poems by Walt Whitman (Nocturne, A Clear Midnight et Joy, Shipmate, Joy! )—dont la dernière, avec ses références nautiques, comporte plusieurs allusions à certaines parties de A Sea Symphony. Les mélodies sur des textes de Whitman ne furent pas les seuls textes de ce poète que mit en musique Vaughan Williams à cette époque: il revint aux Whispers of Heavenly Death—en fait, au même texte qu’il avait utilisé dans Toward the Unknown Region—pour une nouvelle et unique version de Darest thou now, O soul. La nouvelle version (ou peut-être est-elle contemporaine de l’originale, alors révisée?) suit naturellement les mêmes grandes lignes du texte qu’elle renforce par la mélodie et le phrasé de la musique, mais ce n’est pas un reflet servile—la musique est encore plus personnelle comme si, ayant commencé le voyage, le voyageur marquait une pause (comme dans Winterreise) pour faire le point et réaffirmer son inspiration. C’était, comme on peut l’imaginer, une démarche inhabituelle pour Vaughan Williams et l’on sait très peu de choses sur cette œuvre courte, une mélodie pour voix à l’unisson et piano ou (comme dans cette version) pour voix et orchestre à cordes. À l’origine, elle était peut-être destinée à devenir la quatrième mélodie du groupe Whitman composé cette même année—qui sait?—mais elle fut publiée comme une courte pièce isolée pour voix à l’unisson par Curwen, la version avec orchestre à cordes «arrangée par W H» comme l’indique le manuscrit. Les œuvres chorales à l’unisson étaient dans l’air du temps au Royaume-Uni au cours des années 1920 et 1930—le mouvement communautaire du chant, largement encouragé par The Daily Express, s’avéra très populaire entre les deux guerres. Vaughan Williams était certainement au courant de cette tendance, renforcée par l’édition des airs d’hymnes de la nation. Il revint à ce moyen d’expression en 1940 avec ses Six Choral Songs, to be Sung in Time of War («Six Chants choraux, à chanter en temps de guerre»), et ses chants à l’unisson culminèrent en 1943 dans la belle chanson The New Commonwealth sur des paroles de Harold Child, la musique étant tirée de la musique de film qu’il avait écrite en 1940 pour 49th Parallel. Mais la plus grande œuvre à l’unisson de Vaughan Williams est le magnifique Festival Te Deum avec orgue et orchestre (1937), «basé sur des thèmes traditionnels» comme l’indique la partition, une œuvre qui eut tendance à être éclipsée par le Coronation Te Deum entièrement choral composé par Walton en 1953, encore plus magnifique. Curieusement, on notera que l’opus 41 de Rachmaninov, Trois Chansons Russes pour voix à l’unisson et orchestre, fut commencé en 1926; il ne connaissait probablement pas le chant à l’unisson composé par Vaughan Williams l’année précédente—mais comme il se rendait souvent en Grande-Bretagne, peut-on être certain qu’il s’agisse simplement d’une autre coïncidence? Die neun Symphonien von Ralph Vaughan Williams (1872-1958) umspannen mehr als ein halbes Jahrhundert. 1903, zwei Jahre nach dem Tod von Königin Viktoria, begann er mit den Skizzen für A Sea Symphony und 1958, zwei Jahre bevor John F Kennedy zum 35. Präsidenten der Vereinigten Staaten von Amerika gewählt wurde, vollendete er seine neunte Symphonie. Im Laufe dieser langen Zeit wurde Vaughan Williams zu einem der sehr wenigen Komponisten des 20. Jahrhunderts, die mit ihrer Musik ein breitgefächertes Publikum erreichten. Das Spektrum seines Schaffens war riesig: von Kirchenliedern über Opern zu Symphonien, Musik für den Alltag und für besondere Anlässe, für Krönungen und Blumenfestivals, für Filme und Klassenzimmer. Hier war ein Komponist, der sich nicht nur damit beschäftigte, Musik für den Konzertsaal zu schreiben, sondern dem daran lag, für alle zu komponieren, die musikliebend waren, ob Laien oder Profis—dieses Charakteristikum zeichnete sich bereits sehr früh in seiner Karriere ab. Bei einem Komponisten ist Vielseitigkeit allein natürlich noch keine Garantie für Größe, ebenso wenig das Experimentieren mit dem noch nicht Dagewesenen. Vaughan Williams war zwar sowohl vielseitig als auch originell, allerdings war er noch viel mehr. Es ist bekannt, dass um dieselbe Zeit, als er mit den Skizzen für seine erste Symphonie—A Sea Symphony—begann, er ebenfalls mit englischen Volksliedern in Kontakt kam, was seine eigene Musik nachhaltig prägen sollte. Zwar war das nicht ganz ein Damaskus, das er dabei erlebte, da in mehreren seiner eigenen Lieder, die vor seiner Beteiligung an der Wiederbelebung des englischen Volksliedguts entstanden, seine musikalische Sprache ähnlich gestaltet ist—1901 in Linden Lea, 1902 in Blackmwore by the Stour und 1903 in Tears, Idle Tears, Silent Noon und The Winter’s Willow. Diese Lieder sind offensichtlich die Werke eines unverwechselbaren, englischen Komponisten mit einem besonderen Feingefühl für Worte. Doch fand er durch seinen zunächst zufälligen Kontakt mit urtümlichen englischen Volksliedern vielleicht genau das, was er schon immer instinktiv gesucht hatte. Diese These wird durch die unlängst wiederentdeckte Cambridge Mass verstärkt, deren öffentliche Premiere 2011 stattfand und die Vaughan Williams 1899 anlässlich seiner Promotion in Cambridge eingereicht hatte. In diesem Werk ließ er erstmals seine Muskeln spielen, was großangelegte Musik für Solisten, Chor und Orchester anbetraf—derartige Werke mit Chor und Orchester waren in England um den Beginn des 20. Jahrhunderts von großer Bedeutung. Wenn A Cambridge Mass die entstehende Individualität Vaughan Williams’ andeutet, so verrät der rein orchestrale Mittelsatz des Werks einen quasi-symphonischen Ansatz, ein Genre, mit dem sich bereits andere aufstrebende Meister der symphonischen Form auseinandergesetzt und Stimmen mit Orchester kombiniert hatten—in erster Linie Mahler, Sibelius und Elgar. Elgars Werk The Black Knight war fast eine Dekade zuvor erschienen; ein Werk, das er als „Symphonie für Chor und Orchester“ bezeichnete (Elgars Verlag beschrieb es als Kantate). Elgars Originaltitel weist auf den Maßstab und die Absicht des Werks hin, doch als Vaughan Williams seine Cambridge Mass schrieb, sollte The Dream of Gerontius des älteren Komponisten einen bleibenden Eindruck auf den jüngeren Mann machen. Für die Elgar-Gedenkausgabe der Zeitschrift Music and Letters vom Januar 1935 steuerte Vaughan Williams einen Artikel mit dem Titel „What have we learnt from Elgar?“ bei, in dem er schrieb: „Die Phrase Elgars, die mich am meisten geprägt hat, war ‚Thou art calling me‘ aus dem Gerontius, vielleicht nicht so sehr in der ursprünglichen Form, sondern eher, wenn sie später zusammen mit einem anderen Thema wiederkehrt. Als Beweis möge A Sea Symphony dienen [die Passage ist abgedruckt].“ Weiter unten in demselben Artikel führte Vaughan Williams eine Passage aus A London Symphony (seine zweite Symphonie) an, die von derselben Phrase inspiriert ist. Offensichtlich—und nach eigener Aussage—hatte Elgars Gerontius Vaughan Williams nachhaltig geprägt, auch wenn das religiöse Element des Werks dem jüngeren Mann wenig oder nichts bedeutete. Die eindringliche Schönheit des liturgischen Texts—nicht so sehr ihre Bedeutung für den christlichen Glauben, denn Vaughan Williams war zeit seines Lebens Agnostiker—und die Unvergänglichkeit der lateinischen Textabschnitte, die er vertonte, beeinflussten seine schöpferische Phantasie erheblich. Mehr als zwanzig Jahre später sollte er sich dem lateinischen Text der katholischen Messe wiederum zuwenden, als er seine Messe in g-Moll für A-cappella-Chor vertonte. Wie noch deutlich werden wird, hatte Vaughan Williams keine Scheu, denselben Text mehr als einmal zu vertonen—im Laufe seiner langen schöpferischen Karriere kehrte er in mehreren Fällen ein zweites Mal zu einem Text zurück, wobei die Unterschiede in den Vertonungen oft aufschlussreiche Einblicke in seine vielseitige musikalische Sprache gewähren. Zu Beginn der 1890er Jahre jedoch sollte der aufkommende Humanismus (in dem Sinne, dass er die Existenz Gottes verneinte) des Komponisten ihn zu dem Werk des amerikanischen Dichters Walt Whitman (1819-1892) führen. Whitmans Gedichtsammlung Leaves of Grass („Grashalme“), die im Laufe seines Lebens in verschiedenen Ausgaben erschien, hinterließ einen bleibenden Eindruck bei Vaughan Williams und anderen jungen Komponisten, die sich allesamt bemüßigt fühlten, Whitmans Texte zu vertonen. Whitmans Ansichten fanden Widerhall in den Enthüllungen von Vaughan Williams’ Großonkel Charles Darwin, der den musikalischen „neugierigen Jungen“ gekannt und ermutigt hatte—inzwischen war er ein Komponist, der mit seinem Lebenswerk begann. Whitmans Lyrik mag durchaus den ersten Ansporn geliefert haben; Ursula Vaughan Williams schrieb in ihrer Biographie ihres Mannes: „Leaves of Grass war, in diversen Ausgaben … ein konstanter Begleiter. Es war voller frischer Gedanken und die Idee eines großen Chorwerks über das Meer—das Meer selbst, sowie das Meer der Zeit, der Unendlichkeit und der Menschheit—sollte in vielen kleinen Notizbüchern Gestalt annehmen … Er behielt es sehr für sich, entwarf Textskizzen, überarbeitete sie, verwendete und verwarf die Gedichte und stellte sie um.“ Bis 1903 war Vaughan Williams’ künstlerische Reise festgelegt, wenn auch nicht unbedingt die Route, die er dabei einschlagen würde. Und wenn Whitmans Lyrik ihn ständig begleitete, so war die Idee eines ergänzenden Werks zu dem „großen Chorwerk über das Meer“, in dem ebenfalls Whitman vertont werden sollte, ein relativ kurzer Schritt in jener Reise. Wenn man gewisse charakterliche Aspekte des Komponisten in Toward the Unknown Region gleich erkennen kann—die Freiheit, die er sich erlaubte, zu hinterfragen und das Hochgefühl, das er bei dem dadurch Entdeckten empfand—, so werden der Erfolg des Werks sowie Stanfords Unterstützung ihm sicherlich als weiterer Ansporn gedient haben, das deutlich größer angelegte Whitman-Werk zu vollenden, an dem er bereits mehrere Jahre lang gearbeitet hatte; ebenfalls ermutigend wirkte sich sein Aufenthalt in Paris 1907-08 aus, als er bei dem drei Jahre jüngeren Ravel Instrumentation studiert hatte. Als sich die Sea Symphony dem Ende näherte, flossen auch andere, ganz unterschiedliche Kompositionen aus seiner Feder: ein Streichquartett, Bühnenmusik zu der Aristophanes-Komödie Die Wespen sowie ein Liederzyklus für Tenor, Streichquartett und Klavier, On Wenlock Edge—mit allen diesen Werken demonstrierte er die zunehmende Bandbreite seiner Kunst. Die Erstaufführung der Sea Symphony („R L W gewidmet“—Sir Ralph Wedgwood, ein Cousin mütterlicherseits) fand am 38. Geburtstag des Komponisten, dem 12. Oktober 1910, beim Leeds Festival statt, wobei Vaughan Williams wiederum selbst dirigierte; die Solisten waren Cecily Gleeson-White (Sopran) und J Campbell McInnes (Bariton). Die ersten Skizzen für dieses Werk (nämlich Teile des Scherzos und des langsamen Satzes) entstanden 1903 und dann wurde es über die nächsten sieben Jahre allmählich ausgearbeitet. Es wurde erstmals beim Leeds Festival 1910 gegeben und ist seitdem (in leicht überarbeiteter Form) in Oxford, Cambridge und Bristol aufgeführt worden. Die Anlage des Werks ist symphonisch und nicht narrativ oder dramatisch, und dadurch erklären sich die häufigen Wiederholungen wichtiger Worte und Phrasen, die in dem Gedicht vorkommen. Die Worte und die Musik werden also symphonisch behandelt. Zudem ist auffällig, dass Orchester, Chor und Solisten die musikalischen Ideen gleichwertig ausführen. Die Symphonie ist für Sopran- und Bariton-Soli, Chor und Orchester geschrieben. Die beiden Solisten treten im ersten und letzten Satz auf. Der langsame Satz enthält ein Solo für Bariton (und auch einen langen Refrain nur für Orchester), während das Scherzo nur für Chor und Orchester gesetzt ist. Die Texte sind aus verschiedenen Gedichten von Walt Whitman ausgewählt und finden sich in den Leaves of Grass, nämlich „Sea-Drift“, „Song of the Exposition“ und „Passage to India“. Es gibt zwei musikalische Hauptthemen, die sich durch alle vier Sätze ziehen: (1) Die harmonische Fortschreitung, zu der die Anfangsworte des Chors gesungen werden: „Behold, the sea itself“; (2) Eine melodische Phrase [aus der „inspirierenden Phrase“ von Gerontius], die erstmals bei den Worten „And on its limitless, heaving breast, the ships“ erklingt. Diese gewaltige Anlage mag von manchen Hörern für eine riesige Kantate in vier Sätzen gehalten werden, doch die Triebkraft des Werks, die Mahlerischen Proportionen, insbesondere im letzten Satz, die Struktur der vier Sätze und die satzübergreifende Thematik weisen unweigerlich auf eine symphonische Anlage hin. Die illustrative Wortmalerei in Whitmans Texten wird in der Musik wunderbar reflektiert, besonders in den beiden Mittelsätzen (die dem langsamen Satz und dem Scherzo des symphonischen Modells entsprechen). Seit den ersten Aufführungen ist „On the beach at night alone“ als schönste und anschaulichste Passage des gesamten Werks identifiziert worden; bei den Worten „A vast similitude interlocks all“ kommt es zu einem großen, besinnlichen Höhepunkt. Bei der Premiere erklang A Sea Symphony als Erstes, gefolgt von Rachmaninows zweitem Klavierkonzert (wobei Rachmaninow selbst den Solopart übernahm), bevor das Konzert mit dem Don Juan von Richard Strauss beendet wurde. Diese letzteren beiden Werke wurden von Stanford dirigiert, dessen Reaktion auf die erste Symphonie seines Schülers allerdings nicht überliefert ist. Am Tag zuvor hatte Rachmaninow in Leeds die zweite britische Aufführung seiner zweiten Symphonie dirigiert. Es gibt interessante Parallelen zwischen der Sea Symphony und dem ersten großangelegten Werk, das Rachmaninow komponierte, nachdem er die Sea Symphony gehört hatte. Es war dies seine Chorsymphonie, The Bells („Die Glocken“), die er 1913 vollendete und ebenfalls bei der Premiere selbst dirigierte. Beide Werke sind Vertonungen von Texten amerikanischer Dichter—Whitman im Falle der Sea Symphony und Edgar Allan Poe im Falle von The Bells. Beide haben eine viersätzige Anlage für Solisten, Chor und Orchester, und die Gesamtstruktur der Werke ist sehr ähnlich, insbesondere in den Scherzi, die jeweils im Dreivierteltakt stehen, an dritter Stelle kommen und für Chor und Orchester ohne Solisten angelegt sind. Das Hörerlebnis der Premiere der Sea Symphony könnte Rachmaninow dazu inspiriert haben, ein ähnliches Werk zu komponieren, was drei Jahre später verwirklicht werden sollte—es war dies nicht das letzte Mal, dass Rachmaninow von Vaughan Williams’ Musik beeinflusst wurde. 15 Jahre nach der Premiere der Sea Symphony galt Vaughan Williams gemeinhin als bedeutendster englischer Komponist seiner Generation. Bis 1925 hatte er die ersten drei seiner neun völlig individuellen Symphonien komponiert, während des Ersten Weltkriegs freiwillig im Heer gedient und seine Musik, wie die von Elgar vor ihm, war dem größtmöglichen Publikum, vom König bis zum Bäckerjungen, bekannt. Der hohe Stellenwert, der Literatur (gleich welcher Herkunft) für Vaughan Williams einnahm, wurde 1925 mit der Vollendung seines Oratoriums Sancta Civitas für Tenor- und Bariton-Solisten, drei Chöre (Hauptchor, Halbchor und Knabenstimmen-Fernchor) und Orchester auf einen ausgedehnten biblischen Text deutlich. Im selben Jahr setzte er auch einen wortlosen Chor ein, und zwar in Flos Campi (für Solo-Bratsche, gemischten Chor und Orchester), wo jeder Satz mit einem Zitat aus dem Hohelied überschrieben ist. Zudem entstanden ein Magnificat und Nunc dimittis neben dem häufig verwendeten Gesangbuch Songs of Praise, das er mit herausgegeben und zu dem er eine Reihe neuer Kirchenlieder beigesteuert hatte, von denen mehrere den Weg in den allgemeinen Lieder-Kanon zum Sonntagsgottesdienst gefunden haben—ebenso, wie es zwanzig Jahre zuvor mit den Liedern des English Hymnal passiert war. Doch damit nicht genug: 1925 sollte Vaughan Williams noch weitere Textvertonungen komponieren—nicht weniger als vier Liederzyklen auf weltliche Dichtungen erschienen in dem Jahr, darunter Three Poems by Walt Whitman (Nocturne, A Clear Midnight und Joy, Shipmate, Joy! ), von denen das letzte diverse nautische Bezüge und mehrere Anspielungen auf Teile der Sea SymphonyL enthält. Diese Lieder waren nicht die einzigen Whitman-Vertonungen, die Vaughan Williams zu jener Zeit schrieb; er kehrte zu Whispers of Heavenly Death zurück—nämlich zu demselben Text, den er in Toward the Unknown Region verwendet hatte—um eine neue, einzelne Vertonung von Darest thou now, O soul zu komponieren. Die Neuvertonung (oder entstand sie möglicherweise gleichzeitig mit der anderen Version, und ist sie in Wirklichkeit eine Revision?) folgt natürlich in groben Zügen der ersten Version, was musikalische Betonungen angeht, ist jedoch keine sklavische Spiegelung—stattdessen ist die Musik hier noch persönlicher gehalten, als ob der Reisende (wie in der Winterreise) innehält, um in sich zu gehen und seine Inspiration zu bekräftigen. Es war dies, wie unschwer nachzuvollziehen ist, ein ungewöhnlicher Schritt für Vaughan Williams und zu diesem kurzen Werk, ein Lied für Unisono-Stimmen und Klavier oder (wie hier eingespielt) für Stimmen und Streichorchester, sind kaum Hintergrundinformationen überliefert. Vielleicht sollte es ursprünglich an die vierte Stelle in die Whitman-Lieder eingereiht werden (wer weiß? ), doch wurde es als kurzes Einzelwerk für Unisono-Stimmen von Curwen in der Fassung mit Streichorchester „arrangiert von W H“, wie es im Manuskript heißt, veröffentlicht. Unisono-Chorvertonungen waren in Großbritannien in den 1920er und 30er Jahren besonders en vogue—die Gesangsbewegung, die in erster Linie vom Daily Express gefördert wurde, war zwischen den Weltkriegen sehr populär. Vaughan Williams wird dies nicht entgangen sein; immerhin war er ja auch ein Mitherausgeber des Kirchenliedguts. 1940 kehrte er mit seinen Six Choral Songs, to be Sung in Time of War zu diesem Medium zurück, und seine Unisono-Lieder erreichten 1943 mit dem hervorragenden Lied The New Commonwealth ihren Gipfel; der Text stammte von Harold Child und die Musik aus seiner ersten Filmmusik von 1940, 49th Parallel. Vaughan Williams’ größte Unisono-Vertonung ist jedoch das großartige Festival Te Deum von 1937 mit Orgel oder Orchester, dem „traditionelle Themen“ zugrunde liegen, wie es in der Partitur heißt. Dieses Werk wurde oft von Waltons noch prächtigerem Coronation Te Deum (1953) für vollbesetzen Chor in den Schatten gestellt. Es sei darauf hingewiesen, dass Rachmaninows Opus 41, Drei russische Lieder für Unisono-Stimmen und Orchester, 1926 begonnen wurde; es ist unwahrscheinlich, dass er das Unisono-Lied von Vaughan Williams vom Jahr zuvor kannte. Doch hielt er sich regelmäßig in Großbritannien auf—können wir also sicher sein, dass es sich bei dieser Parallele wiederum lediglich um einen Zufall handelt?